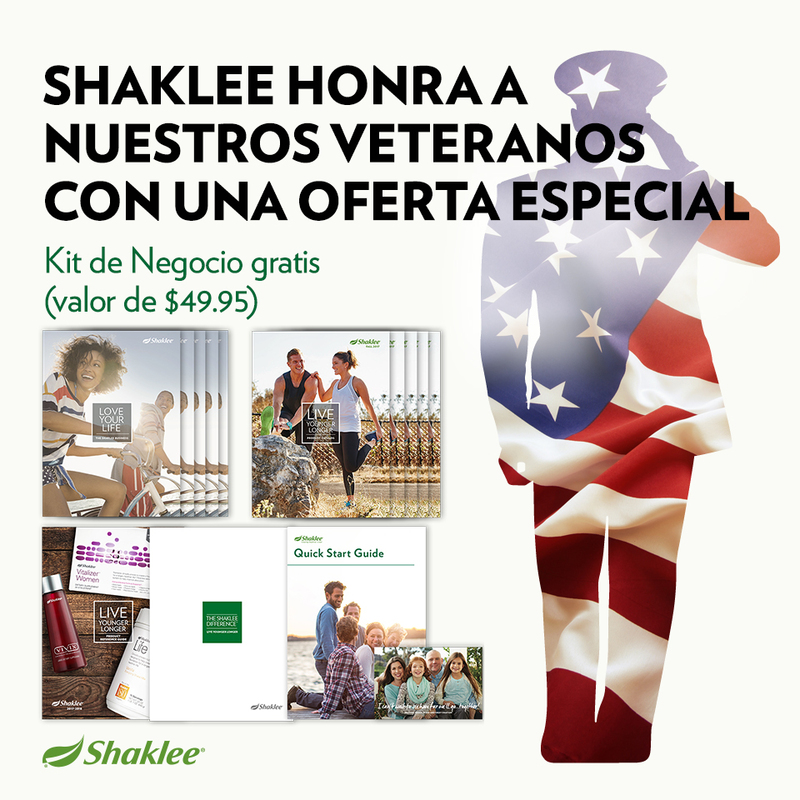 Shaklee welcomes our veterans to join us and create their own Shaklee Effect™. There is no expiration date for this offer at this time. Proof of military service is required. 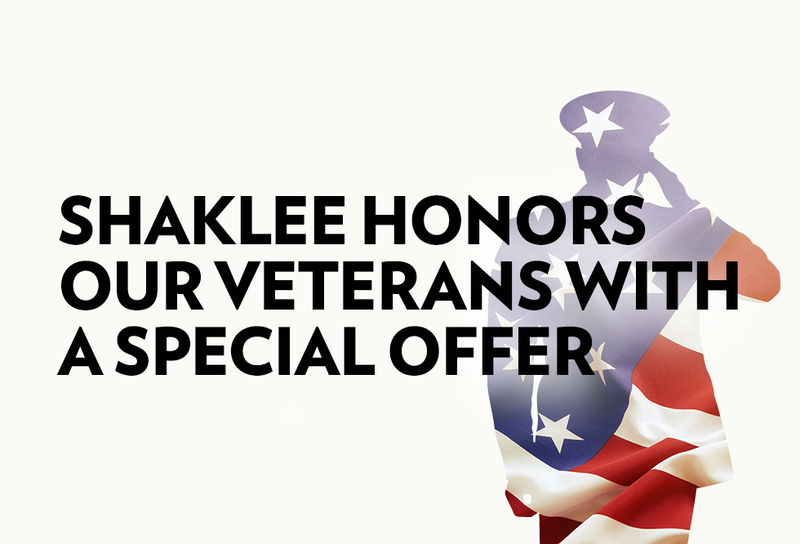 Please contact us at 1-800-SHAKLEE (1-800-742-5533) to redeem this offer. Supporting documentation can be faxed to 925-924-3888 or emailed to fieldsupport@shaklee.com. Please use promotion code VETERAN, and please let the Customer Support person who processes the application know that you are taking advantage of this offer as early as possible in your conversation. Please be aware of policies regarding operation of a Shaklee business on military bases. It's required that a Shaklee Distributor seek and obtain the written permission of their base commander before beginning to operate a Shaklee business on base. This offer is not transferable to other distributor offers or kits. This offer is valid in the U.S. and Canada. Not available online. Orders must ship via USPS Parcel Post only. No sponsoring activity may take place on military bases unless you have received approval and we have received a copy of the letter. If the military base is outside of the US and its territories, then product may only be distributed on-base. Share this with the veterans and active duty military you know! A: Veterans, retired and active duty military personnel, including military spouses. Q: Can a current Member upgrade free with this offer? A: Yes. Field Support needs to handle this redemption, but the existing Member can call 1-800-SHAKLEE (who will escalate to Field Support). Alternatively, their upline Business Leader can call Shaklee Field Support at 1-925-734-3636 directly to request the free upgrade. Q: Can someone who takes advantage of this offer earn Success Bonuses? A. Yes. They would need to purchase one or more Success Packs, which will make them a Qualified Distributor, eligible for Success Bonuses. Be sure to encourage them to enroll in Direct Deposit, so that they can receive any bonuses they earn right away! To learn more about Success Bonuses, see the 2017-2018 Incentives Booklet. Q: If I share this with someone who qualifies and calls to take advantage of the offer would they become my downline distributor? A: Yes, they will be asked to name their sponsor. If you can, initiate this sponsorship as a 3-way call to 1-800-SHAKLEE. That way you can be present to ensure everything about the transaction goes smoothly. Q: Can the military personnel I sponsor operate a business on base? A: Military personnel and their families may build a Shaklee business on-base, provided that they have the written permission of their Commanding Officer. Once approval is granted, military personnel must mail or fax a copy of the approval letter to Shaklee Field Support at 1-925-924-3888. The no sponsoring activity flag will be removed only if Shaklee receives a letter granting approval from the Military. Otherwise, this restriction will remain in place. Shaklee allows shipments to military personnel stationed overseas with APO/FPO (overseas military) addresses via the Shaklee Order Entry system. You can also sponsor new Members with an APO/FPO address.